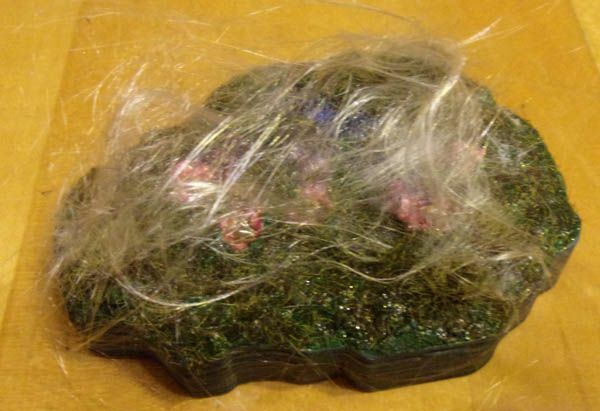 Having finally got my 3D printer working properly again, I've been playing around with terrain design. I'm hoping, once I get something I like, to upload it for anyone else wanting to get a 3D model. 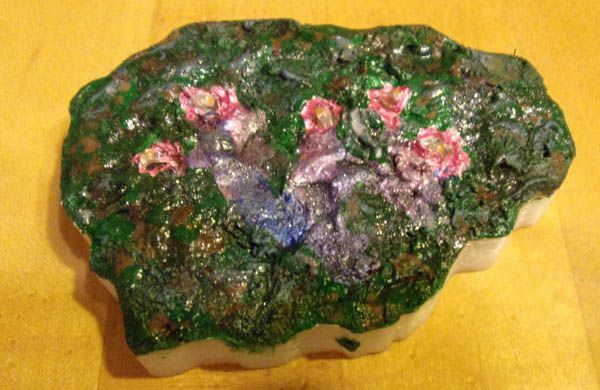 Here's an early prototype of the Latari Memorial. 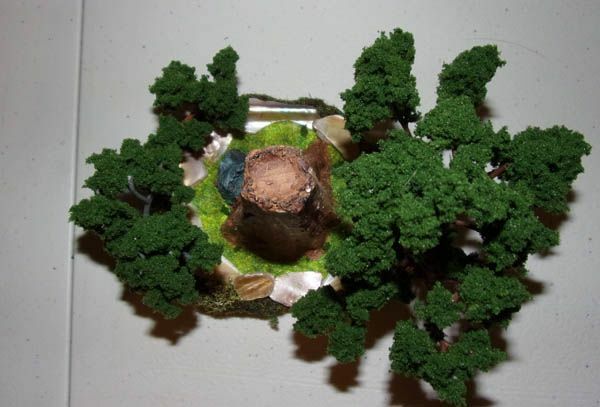 My current plans are to add a ring of polished stones around the trunk, with printed-in bushes outside the ring. I'll be carving the trunk a tiny amount by hand, and adding some undergrowth/vines to it. If anyone has any other ideas about how to spiff the thing up, I would be more than happy to hear them. I'm only sort of keeping up with the lore of the land, and am not worrying about it for how I do my army, but on the other hand, I am hoping that I'll like the final product enough to upload it, so if there's something I'm supposed to know about the memorials, let me know so that anyone who does know about the lore won't be disappointed with it. The base matches the original footprint within 1 mm. That small variance is sometimes a bit too small, and other times a bit too large, but it should be close enough for anything except a tournament with very uptight players or judges. Sweet. Looking forward to seeing it all painted up! Yes please have files I think this game needs 3-D terrain!! 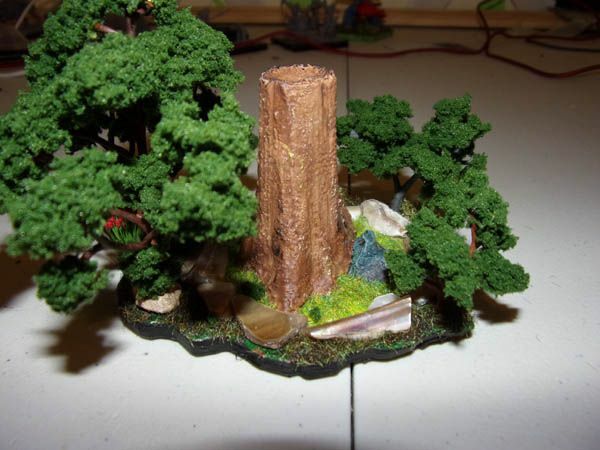 Let me know when you want to start selling 3d terrain for runewars and I'll throw money at you. I'm still in the working-on-it phase. I'm afraid my printer definitely falls into the "My First 3D Printer" category, and has been temperamental with my attempts to have it print saplings to go along with the massive tree trunk, so I'm probably going to ultimately go with my first attempt, and add in model railroad trees and flowers. As for sending money to me, unless you live in the central-to-southern Ohio region, price out the job at Shapeways first: they have much better equipment than me. Edit: never mind Shapeways. I priced them out, and they've gotten significantly more expensive in the last few years. If you want to tip me, I won't say no. But what I did was mostly combine other people's work, so it's not like I spent weeks on this file. Shhhhhhhhh ? Don't give away your secrets. Bill Gates did the same thing...just sayin'. ? For those of you new to 3D printing: if you don't have a personal printer (not surprising), the first place to look is, if you're a student, in your school: many high schools and most universities will let students use their printers. If you are unable to find one this way, the next place to check is your local library. I'm not sure how widespread this is outside of where I live, but around here, all the library systems I know of have printers for public use, with reasonably low fees for the filament usage. 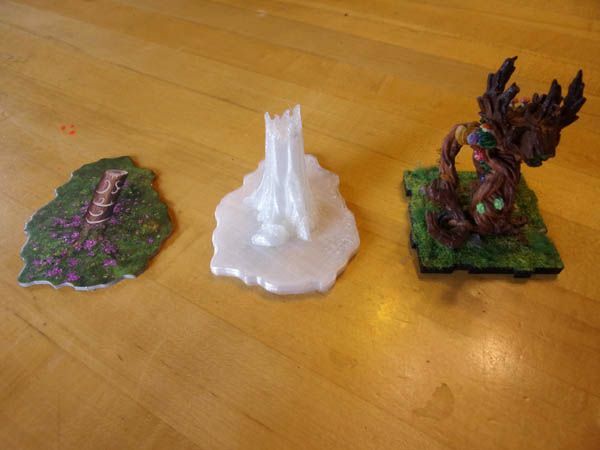 If you still have no luck, I believe Thingiverse, the place hosting these files, has print-and-ship services available, but won't swear to that. 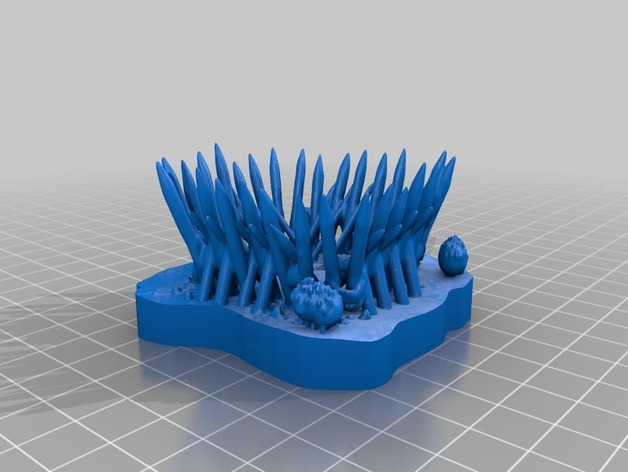 The places you want to avoid are the targeted-at-professional places like Shapeways; these two small pieces of terrain from them would run more than three boxes of Ventala Skirmishers. Also, if you're new to printing, a few things you should know: most types of filament should be good for this. PLA is probably cheapest, and ABS is also good, although it requires a heated print plate to work properly. Avoid anything that has a notable grain. If your software gives you the option (most do), you want at least a .8 mm thickness wall, and 1mm is a bit better. At least medium fill, to give it a bit of extra support as you carry it around. Go with as high a resolution whoever owns the printer will let you get away with, as that will minimize the amount of filling or sanding you need to do. 100 microns (0.1 mm) is probably what you want to shoot for. And no matter how high a resolution you go with, you're still going to do some filling or sanding, unless you want horizontal bands in your scenery. Actually, it won't matter that much for the Dimoran Fissure, as that one has a flat top. 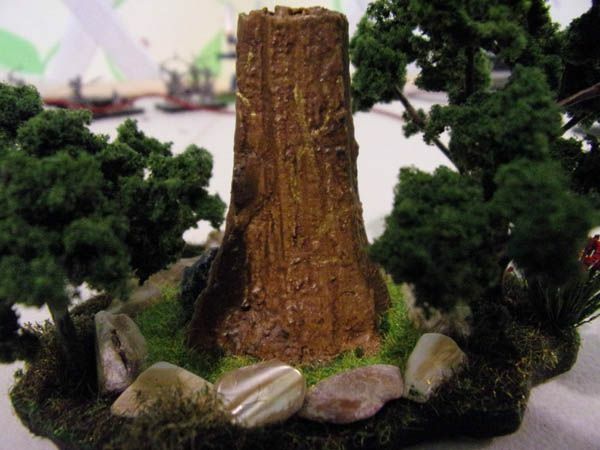 And it can be a feature in some things (when I printed some energy tokens, for instance, I painted them brown with a heavy wash, and got a wood-grain effect with them), but it doesn't work all that well with tree trunks. As for what to use for filling, there are a number of different suggestions online, some of which are expensive and some of which aren't. These files are intended to have a lot of postwork done on them. I experimented with a wide variety of alternate ideas for the Latari Memorial for having various plants printed with the flat surface, and none of them came out good enough—even the upper end printers have trouble with fine detail, and the results with mid-to-low end printers weren't good enough to not break when trying to clean them up, if they printed at all. The Dimoran Fissure has two options: one that's flat, with the terrain the same height as the base for the Memorial (8 mm, which is just a hair shorter than the height for the unit trays), and one that's taller (14 mm), with a hollowed-out section beneath it, where I intend to put a battery pack for some LED lights that I intend to add to the thing. The taller one also has some holes running through the surface to run a LED string through as part of my decorations. I'm still working on getting prints I'm satisfied with and picking up the remainder of the things I'm going to be using to bling out the terrain, so I'm not certain when I'll get pictures up, especially since I need to get a few more traditional paint jobs finished before continuing on with terrain. 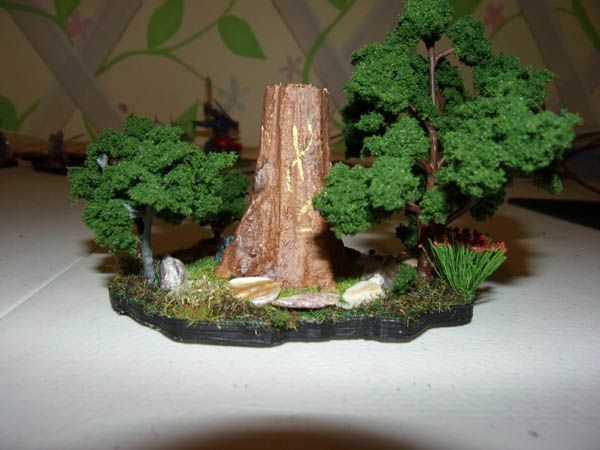 My next project will be the spikes/rocky outcropping terrain set. I do not have any estimation of when I'll get them done, but all things considered, I'm not expecting it to be done quickly. Work in progress pictures for the Dimoran Fissure. I did the hollow print with five holes in it, and covered the resulting print in a layer of wood putty that was old enough that it had started separating the liquid and solid parts, so the resulting stuff (after I removed the liquid that got all over) had a very rough appearance. The lights are a product called Moon Lights from a company called Darice—these are the 12-strand lights, that use flat watch-battery style batteries, not the longer strands that use AA batteries. (The battery packs for the longer strands don't have a chance of fitting beneath the terrain. 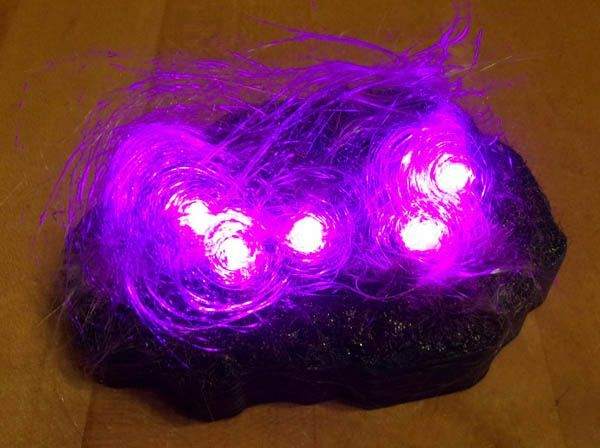 I counted out five lights, and clipped off the rest, then strung them through the terrain and hot-glued the battery pack and wires into place. 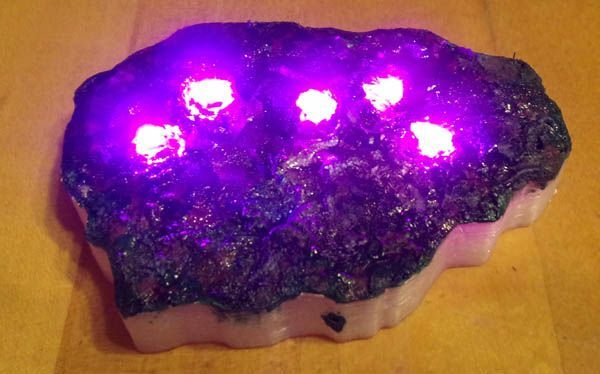 I'm planning on adding grass and a few scrubby bushes around the edges, but most of it's going to be covered by varying thickness layers of spun glass, which I'm hoping will do interesting things with the lights. First off, I've been surprised to see just how many library systems have 3d printers available... if you ever wanted to try 3d printing, but didn't want to drop the money for a printer, check out your local library; there's a reasonable chance you can get stuff printed there, quite inexpensively. The downside to printing is, of course, the horizontal print lines left behind. I took wood putty and smeared a layer over the print. Then, after it dried, I took some files and smoothed it down a bit, using in a vertical motion, which gave the tree the look of something that had bark going vertically, the way it normally breaks (barring unusual trees like the sycamore). I deliberately left in a few oddities, and when I painted them I shaded them differently from the rest of the tree. The odd-looking stone circle is made up of broken shells, found at, if I recall correctly, Michael's. If it wasn't Michaels, it was Hobby Lobby.